Personal questions (interviewers inquire about your education, motivation, goals, and previous working experience in the field). Behavioral questions (interviewers ask these questions to assess your attitude to pressure, deadlines, conflicts on the workplace, and to other situations that happen in a daily job of an engineer). Technical questions (these questions are related to the technical aspect of the job, and the hiring managers ask them to test your real knowledge of mechanical engineering, and readiness for the particular role in the company. Luckily for you, right now we experience a deficit of mechanical engineers, and companies literally fight for skilled job candidates. 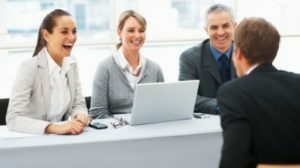 In many cases you will be the only person they interview for the job, or you will compete with one or two other people for the position (which is nothing compared to managerial positions, or jobs in banks, when one competes against dozens of other job applicants). Still, even if you are alone, you will have to convince us of your readiness for the job, of the right attitude to work and to other people, and of knowledge of mechanical engineering. Let’s have a look at the questions! 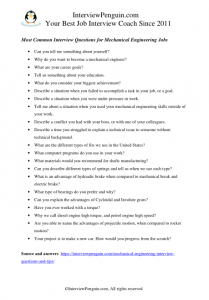 * Do not forget to check also Electrical engineering interview questions. Can you tell me something about yourself? Speak about your experience, background, and your passion for mechanical engineering. You can even talk a bit about your education, and how it prepared you for this role. Mention briefly one or two hobbies from your personal life–this helps to break the ice, and to create a friendlier atmosphere in the room. Why do you want to become a mechanical engineer? Focus on your motivation, passion for this job, and also confidence in your designing and engineering skills. You should also say that you enjoy doing what engineers generally do, and can’t imagine having any other job at this stage of your career. Do not talk about money. Obviously, mechanical engineers earn a lot, and they deserve it. But you should not point out a great salary as a reason for your job choice. What are your career goals? You should simply say that you would like to work as a mechanical engineer and develop your experience in the field, specializing in a certain area of engineering. If you are not sure, tell them that you’d like to work on various designs, and will re-evaluate your career plans in few years from now. Tell us something about your education. What subjects did you enjoy the most, and the least? How have your studies prepared you for the work of an engineer? What do you consider your biggest achievement? Speak about something unique, not something everyone else has done. Try to talk about designing a machine, or about some interesting improvements you made to a certain design. If you managed to overcome a difficult period in your life–for example a life-threatening illness, you can point it out as well. Describe a situation when you failed to accomplish a task in your job, or a goal. Try to be honest, show us that you are aware of your mistakes and failures. Everyone fails sometimes. The different between great and average employees is that great people will learn from their mistakes, and will move on quickly, ready for the next challenge, not affected by their recent setbacks. Describe a situation when you were under pressure in work. Tight deadlines, goals that are difficult to meet, and a boss who expect too much from us–all of that can result in a pressure on a workplace. Narrate a situation when you experienced pressure, a situation that had a happy ending. That means a situation when you eventually overcame the pressure, and it did not affect you negatively in your job. Some people crack under pressure. Other work harder, and better. And some people are simply so relaxed that they do not experience any pressure in job–they just don’t let it in… And what about you? Tell me about a situation when you used your mechanical engineering skills outside of your work. Describe a conflict you had with your boss, or with one of your colleagues. Describe a time you struggled to explain a technical issue to someone without technical background. Special Tip: Behavioral questions represent the trickiest part of this interview. Obviously it is not easy to talk about some situations, such as facing pressure or reaching a goal, especially when you apply for your first ever job. If you find these questions difficult, consider having a look at our Interview Success Package – it offers multiple great answers to all difficult behavioral questions, including answers for people who apply for their very first job. Thank you for checking it out! Mechanical engineering is a technical field, and the interviewers will ask you at least some technical questions. Their difficulty will depend on the person who leads an interview with you, and their own knowledge of mechanical engineering. It will also depend on the number of people you compete with for the job. What are the different types of fits we use in the United States? 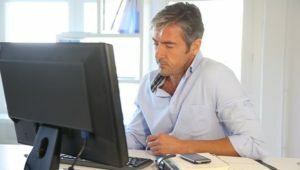 What computer programs do you use in your work? What materials would you recommend for shafts manufacturing? Can you describe different types of springs and tell us when we use each type? What is an advantage of hydraulic brake when compared to mechanical break and electric brake? What type of bearings do you prefer and why? Can you explain the advantages of Cycloidal and Involute gears? Have you ever worked with a torque? Why we call diesel engine high torque, and petrol engine high speed? Are you able to name the advantages of projectile motion, when compared to rocket motion? Your project is to make a new car. How would you progress from the scratch? Technical questions can differ a lot from one interview to another, and they depend on the things the company designs. Behavioral and personal questions will be similar every time you interview for a job of a mechanical engineer. While you will not face a tough competition in this interview (unless you apply for a job with Google, or with General Electric), you still have to show the hiring managers the value you can bring to their company, and demonstrate your engineering skills. You can do it with right answers to both technical and behavioral questions. Thank you for reading, we wish you good luck. InterviewPenguin.com – Your best job interview coach since 2011.